Does CS:GO have a future in the UK? Discussing UK esports with HenryG and Pansy. With the recent ESL Pro League Finals taking place at the O2 and the Esports Championship Series to conclude in the SSE Arena Wembley later this month, it’s clear that UK Counter-Strike is on the rise. At the ESL Finals, two of the UK’s most recognisable CS casters, Henry ‘HenryG’ Greer and Lauren ‘Pansy’ Scott, shared their thoughts on watching their home scene develop. Henry ‘HenryG’ Greer is a caster/analyst for Global Offensive, usually partnered with the Canadian Matthew ‘Sadokist’ Trivett. Though the UK scene is only just finding its feet in comparison to the mainland majors of Cologne and Katowice, this wasn’t always the case. In the days of Global Offensive’s predecessor, Source, the UK was up there with the best, fielding mighty teams like London Mint, Birmingham Salvo and 4Kings. While most tournaments at the time were smaller grassroots events, the Championship Gaming Series of 2007 hoped to up the ante with a bigger, more professional environment, acting as part of a push to have CS shown on national television. As a player for London Mint, Henry was directly involved in the first real drive, and subsequent failure, of mainstream esports in Britain. 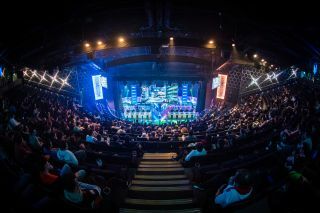 While television may have seemed like the logical end goal ten years ago, the advent of streaming services such as Twitch has completely revolutionised esports media, freeing providers from the constraints of standard broadcasting services. Beyond the tournaments themselves, many players run successful (and lucrative) personal streaming services. For the dedicated, this offers the chance to directly connect with and support their favourite players. Lauren ‘Pansy’ Scott is an ESL-employed caster for Global Offensive as well as other titles such as Battlefield, World of Tanks and Dirty Bomb. As competitive gaming continues to soar in popularity, the changes are finally starting to take place, with dedicated UK arenas being established by both Gfinity and ESL. Clearly testing the waters, early events saw CS:GO sharing space with other titles such as Call of Duty and Super Smash Bros Melee at Dreamhack London. Since then the success of competitions like the ESL Pro League Finals have sent a clear signal: the UK has a committed audience for CS, and they are as passionate as they come. “Gaming as a whole in the UK has had this stigma attached to it in the sense that it’s quite nerdy and geeky,” says Henry. “But now people are starting to realise that it’s actually quite a cool thing to do, it’s actually quite exciting. With these kind of events we’re raising awareness slowly but surely. Where are the UK teams? CS:GO broadcasting is overflowing with British talent. From Duncan “Thorin” Shields to Alex “machine” Richardson, you’re all but guaranteed to see a UK face at any large event. Despite this, the UK has been painfully slow to establish itself in hosting tournaments. It’s hard not to think that this is, in large, due to the lack of any presence from a local team. While the ESL audience showed no end of love for the French G2, a home side could draw an entirely different level of attention. Despite this it has been difficult to draw interest in sponsor support for a UK side. As a former player, this is clearly a topic close to Henry’s heart. “[Last year] I had my own company and set up a British team to go to events and we sent them to Dreamhack London,” continues Henry. “That was the first time a British team had made it to a big event. They took down the Australian Team Renegades. In London, taking down one of the bigger names for the events, it was a fairytale story. The problem is, once we finished that event we had nothing else to play for. We hadn’t been invited to any big events and the team stagnated and dropped off. That was about a year ago and the scene has changed so much since then." Valve has since introduced the Minor system in order to encourage and nurture smaller teams. Accepting only sides which have not previously participated in Majors, the Minors offer both a $50,000 prize pool and the chance to compete in the offline Major qualifiers. So with the support finally in place, and increasing attention being diverted to hosting, is it finally time for a stable UK side to emerge? On that front, the jury is still out.